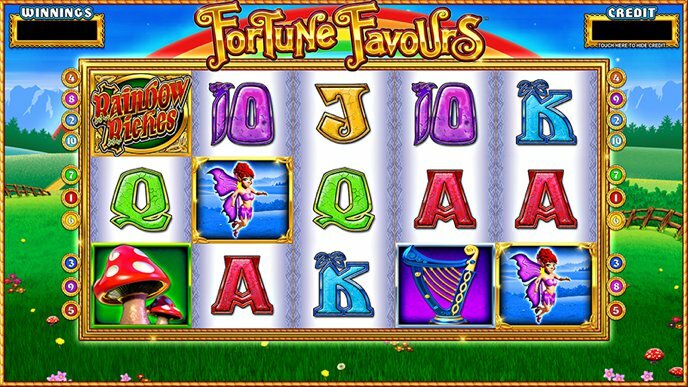 Rainbow Riches Fortune Favours is a new style Rainbow Riches themed slot from SG Gaming that borrows heavily from Blueprint’s Luck O’ the Irish, and surprisingly doesn’t make much use of the popular Rainbow Riches theme. There are no real features on Rainbow Riches Fortune Favours, instead it uses mystery symbols which may possibly match any of the visible symbols on the reels to create one or more wins. Rainbow Riches Fortune Favours is played across the usual five reels and uses ten winlines. The wins pay adjacent, just like the aforementioned Luck O the Irish. The reel symbols match the Rainbow Riches theme, and are incredibly well detailed, bright and bold. This isn’t too surprising as the slot was made primarily for the new Equinox fixed odds betting terminals, although of course it is still available on the older FOBT’s in Coral and Ladbrokes betting shops, as well as online in a few locations. The basic game (not the Mega Spins) is played on one screen, with the mystery symbol available on all stakes. There are nine different symbols plus the mystery, which is a fairy. Rainbow Riches Fortune Favours would be considered a lo-tech slot game, and is very basic to play. As I mentioned previously, there are no features, so the Rainbow Riches theme seems a bit wasted. On the plus side, there is no learning curve, you could easily play this for the first time and fully understand what was going on. Although it is difficult to hit five of a kind symbols; you will mostly be seeing three of a kind and the occasional four, the five of a kind wins all pay very well. Five Rainbow Riches symbols on a winline will pay the £500 jackpot. The other symbols pay £40, £30, £20 and £10, but often pay in clusters across several winlines, resulting in a ‘Big Win’ animation. Rainbow Riches Fortune Favours is fun and smooth to play, and very basic. There is however an optional gamble which is similar to Reels of Gold. You may choose to gamble any win, wins £5+ or no wins. 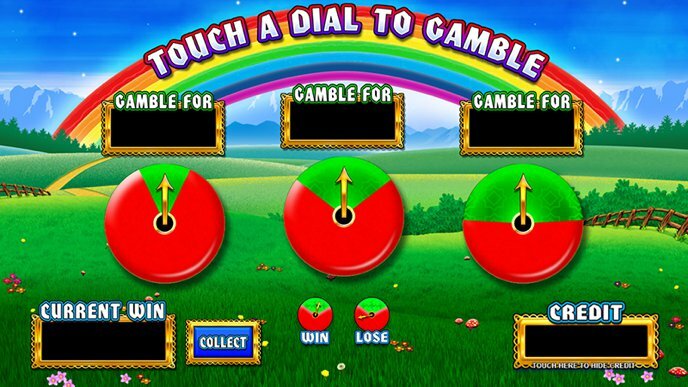 The gamble options are shown as three pies, each with a red and green section. You can choose to gamble for odds of either a 75% chance of winning, a 50% chance of winning, or a 25% chance of winning, with the values displayed accordingly. As it is a bookies slot machine the maximum you can gamble to is £500, you can also bank or part-bank any win. The maximum £2 stake version of the slot is good fun and will suit most players. For those that prefer higher risk however may enjoy the Mega Spins version of Fortune Favours, where stakes can be selected from £10 up to £50. All stakes use four gaming windows (reel sets) instead of the regular one. £50 Stake: The Mystery and Wild transfer, plus all 10, J and Q symbols are removed from the reels. The transferring Wilds help for some pretty big wins, and hitting them didn’t seem to uncommon when I gave it a try. The £50 stake removes the three lowest value symbols which seemed to result in a lot of K wins rolling in, which helped to keep the balance steady. Obviously the £50 stakes are not going to be for everyone, you are still limited to the £500 jackpot per game, so some of those spins may go to waste if you reach the £500 limit early. The gamble option is still available on the Mega Spins, so you may wish to go for even bigger wins. Rainbow Riches Fortune Favours is a very good slot on both the regular game and the more expensive Mega Spins. SG Gamings attempt to cash in on the huge popularity of Luck of the Irish may have finally paid off!